Block Island historic property in the 'Old Town', initially build around 1850, this property housed the General Store. Completely renovated in 1985 by owner, amenities include hard pine floors and new kitchen and bath. The bedrooms are a queen size bed, a full size bed and an additional queen sofa in living area to sleep 2 more people, plus a private entrance and bath. Amenities include, full kitchen, gas grill, air conditioning, wireless internet and outdoor shower. Lawn chairs set up under 2 maple trees for out door seating. Keywords: This Historic Property(1850's) has been completely renovated and is located about 1 mile from town and beaches. The house has a total of 3 units consisting of 5 bedroom, 3 baths, queen couch, and 2 futon couches (Each unit sleeps 6 max.and studio sleeps an additional 4.) Amenities include hard pine wood floors, tile bath, Dish TV, outdoor shower, air conditioning, appliance kitchen. 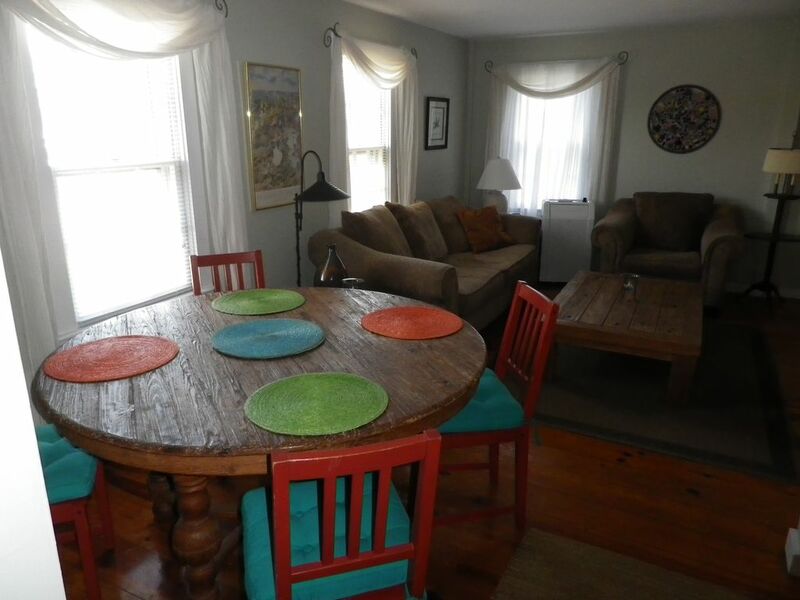 Can be rented Sunday to Thursday (2-5 nights) weekends-Friday-Sunday (2 night minimum) or weekly (7 nights max). I am a long time owner of my Block Island house and have recently moved back to the Island from Stonington, Ct. I rent seasonally by the night, week and weekend and 6 months in the winter while residing in my studio apartment. Retired from the corporate world, my interests are woodworking, travel, and the pursuit of a healthy lifestyle. Flexibility is the reason to rent this property. This unit can be rented nightly; midweek, Sunday -Thursday (3 night minimum), weekends (2 night minimum, 3 nights on HOLIDAY weekends), or weekly. Can rent 1 unit to sleep 6 or more to sleep a total of 16. Linens and towels are included. Please contact owner for availability and rates. Center Rd Apartment offer tastefully decorated, clean, air conditioned units for a comfortable stay. Easily accessible on Center Rd, 1 mile from town and beaches, 1/2 mile to New Harbor, near to everything, but away from the hustle and bustle of town. Altough it is a 1st foor unit it has no ramp. Can be combined with VRBO listing #335799 to add up to 6 more people also with listing #896316 to add 4 additional You would then have 4 bedrooms, 2 baths, and 2 kitchens. Each unit has a separate entrance. Easy, peaceful, place to stay! All the cabs know this place by name on Block Island! We enjoyed our stay and the property was maintained very well! It's walking distance to top restaurants like The Oar, & Dead Eye Dicks. Only about 20 minutes walking to downtown attractions. The host greeted us and showed us the property upon check-in which made me feel comfortable. There are two additional units upstairs, but we didn't hear or see anyone while in town. Highly recommend staying at Arnie's! Clean house and friendly host on a fantastic island. Thanks for another great experience Arnie. Great property in Block Island! I highly recommend this house for your stay in Block Island. It was perfectly sized for a family of 4, is in a great location, and had all the amenities we needed. Arnie was very helpful both before and during the stay. The one negative was that the internet didn't work too well, but it didn't impact our stay. I highly recommend this property! Great spot for a long weekend stay. The apartment was the perfect fit for 6 people (3 couples) for a weekend stay on the island for a wedding. It definitely beat the price of staying in a hotel. We had everything we needed and the owner, Arnie, was very accommodating and close by in case we needed anything. The unit is centrally located, making it easy to get where we needed to go. The apartment was very clean, and had space to spend to spend some time outside during our spare time. Would definitely stay there again! Very clean, peaceful and comfortable. Everything was clean and orderly in this lovely apartment. The owner was friendly and helpful.